The rubber outsole has been extended to the front of the toe providing greater protection and increased uphill traction. 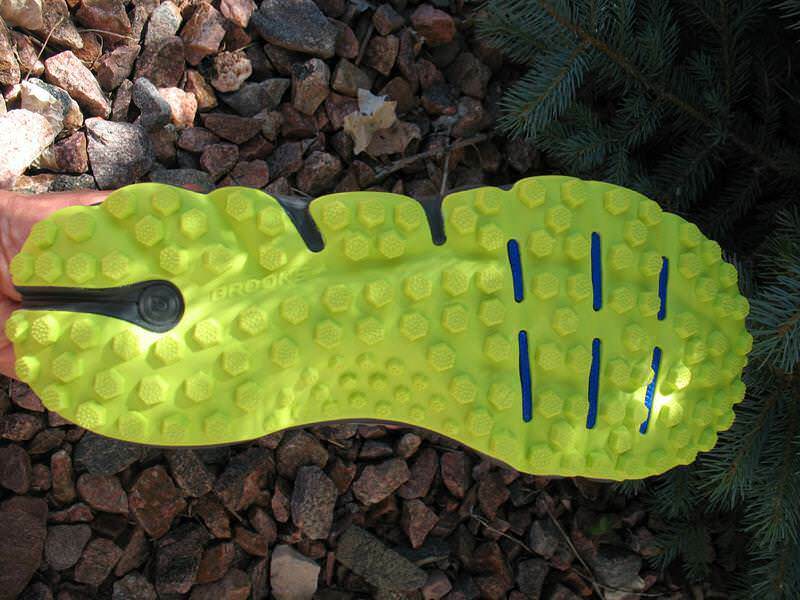 Newly added propulsion plate provides excellent forefoot protection while providing super energy transfer through toeoff. 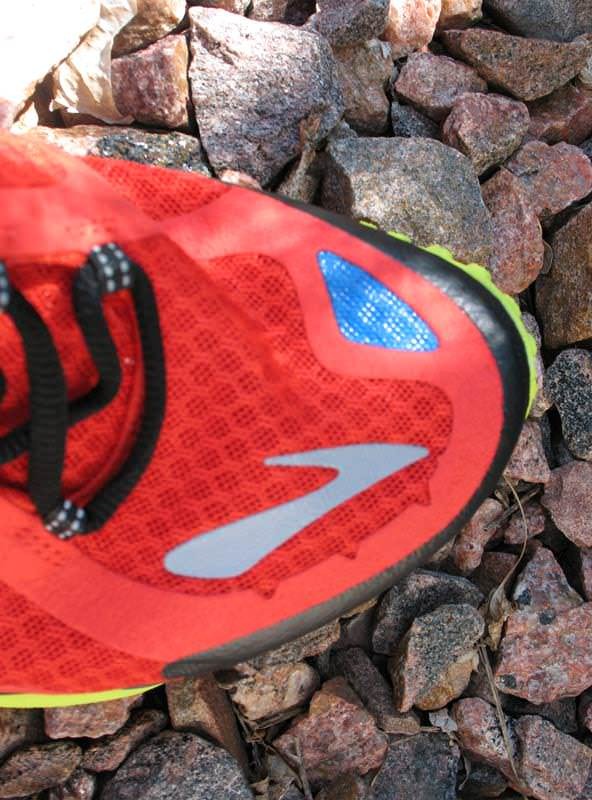 New aggressive lug pattern makes the shoe perfect for technical terrain and climbing. Traditional tongue has the tendency to move to one side and bunch up. 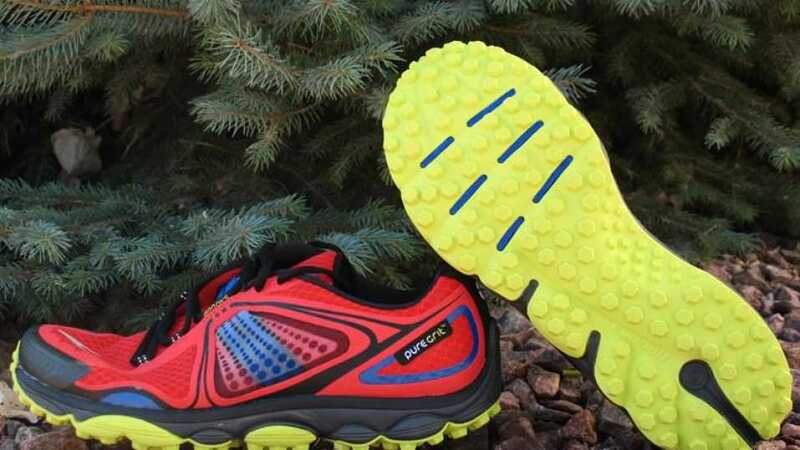 The PureGrit 3 is an awesome shoe for runners looking to do some serious miles on the trails, but not in a huge midsoled, monster lugged traditional shoe. 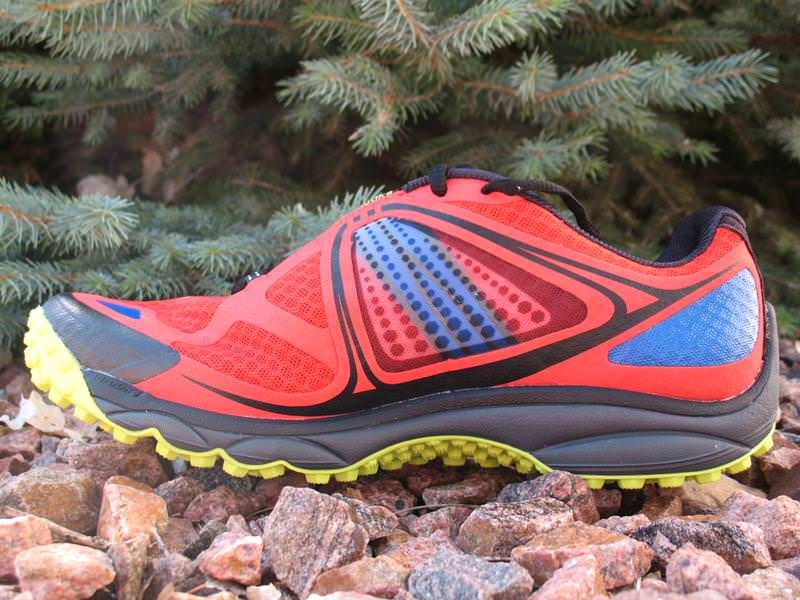 The PureGrit 3 is simple, comfortable, and capable of carrying runners fast over any trail. Neutral runners looking for a great semi-minimalist performance trail shoe that is well suited for mild to aggressive terrain. 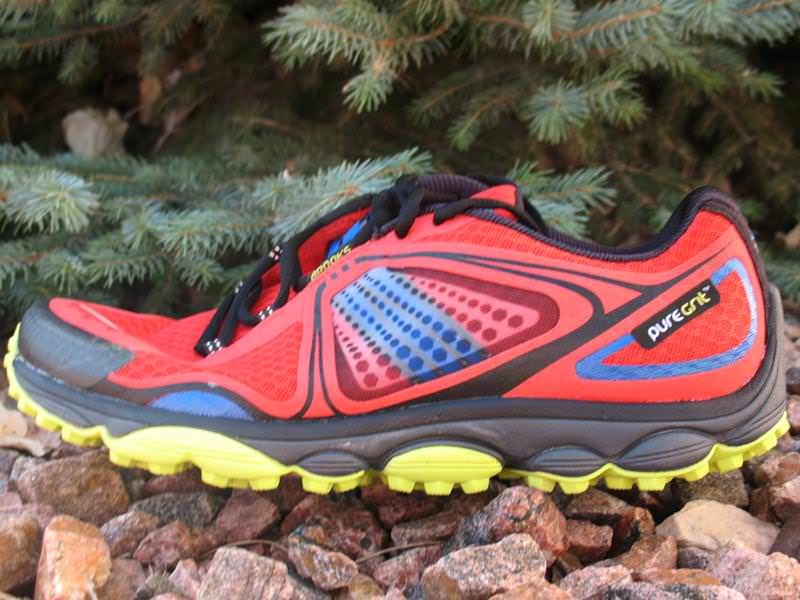 In its third iteration, Brooks PureGrit 3 gets redesigned from top to bottom. The 3 sports a much more aggressive look, but continues to hold true to the principals of the Pure Project collection. This newest version has done away with the split toe design in favor of a more tradition one piece outsole with a more aggressive lug pattern. The addition of a forefoot rock plate has also been slipped into the 3. The coupling of these two elements have made the PureGrit 3 a much more desirable shoe for a variety a terrain than its predecessors. I have to say that when I received the PureGrit for review I was super excited as this has now given me the chance to have sampled every shoe in the collection. After looking over the modifications that Brooks had made to the shoe I was even more excited to get into the shoes and on to the trails. What really impressed me was the new aggressive look of the shoe. Immediately out of the box the shoe had great traction and comfort. The 3 also has a nice roomy toe box that was immediately evident and appreciated. Like all of the shoes in the collection the PureGrit 3 had a nice low profile stance. The Midsole of the PureGrit 3 remains consistent with the rest of the Pure Project collection and begins with an anatomical shaped bed of Brooks BioMoGo DNA enhanced foam. While this gives the shoe it’s just right cushioning and responsiveness it also makes it slightly less sensitive for it to be a minimalist shoe. I was pleasantly surprised at how well the foam protected my feet and provided superb cushioning over the sharp rocks, and steep hills in such a reasonably thin midsole. The biggest change to the outsole of the PureGrit 3 is the move to a one piece construction with a more aggressive octagonal lug pattern. In addition, a forefoot rock plate has also been added. The overall traction of the shoe was top notch providing me with unwavering confidence when hammering downhill’s however, were were a bit squirrely through tight corners but still better than most trail shoes. 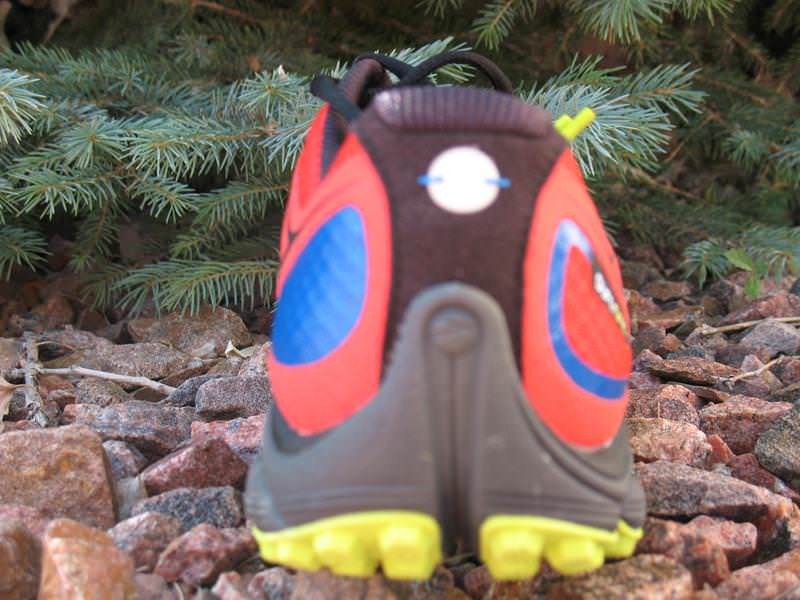 The shoe climbs like a bear over any terrain. The added rock plate provided great overall protection on the most technical trails while also providing a nice touch of added propulsion through toeoff. Another feature that I also liked was the toe cap that definitely saved me from a few missing or blackened nails. The PureGrit 3, like all the shoes in the collection,has changed to a silicone vs. elastic Nav Band. The difference between the PureGrit and the other shoes in the collection is that the band does not extend down into the medial side of the shoe. The band provided nice midfoot support and lock down while allowing movement and eliminating discomfort. By in large the upper of the PureGrit 3 seems fairly unchanged. However, upon closer examination runners will find a more traditional tongue versus the medial coupled wrapped tongue that is consistent in the rest of the line. While I am not sure completely why Brooks deviated with this shoe, the answer may be as simpleas just to accommodate a wider variety of feet. As for my experience this new tongue was definitely a negative and what kept it from being a nearly perfect shoe. I had difficulty keeping the tongue centered on my foot and after only a few miles it would move off to one side of my foot, typically the lateral. While this may seem nit-picky I feel it becomes notable when it begins to cause discomfort that graduates into irritation. Hopefully I am not alone and the good people and Brooks will take some notes and just leave the tongue alone. The combination of welded and stitched overlays gave the rest of the upper a nice comfortable fit, and the open mesh on mesh material not only was breathable but shed water well. The PureGrit 3 is a great performance trail shoe in that it fits nicely into the void between traditional and minimalist shoes. The PureGrit has a very natural feel and simple look, but has just the right amount of cushioning and support to keep it light, fast, and fun to run in. 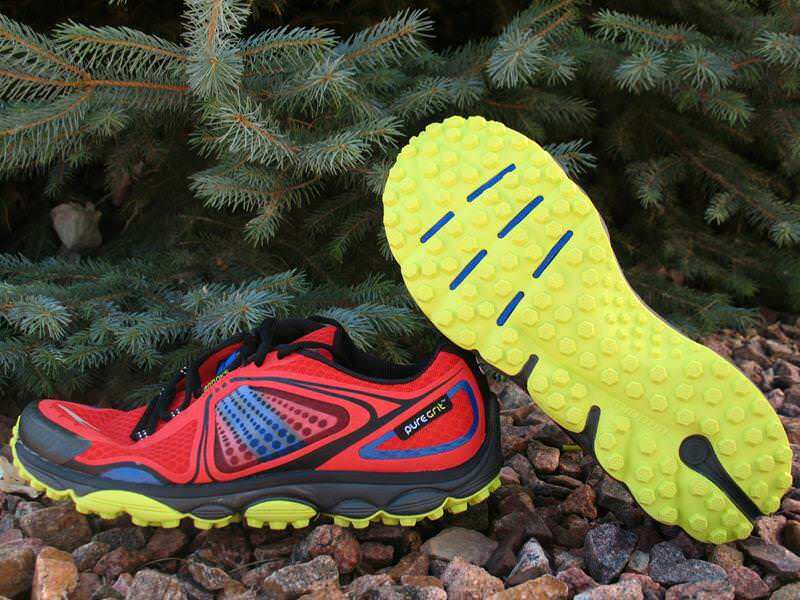 The 3 for is great for long trail and off road runs, and I am now using it as a go to race shoe. The upgrading to the more aggressive outsole and the addition of the rock plate is definitely a plus as the shoe performs so remarkably well on any terrain that you put beneath it. In my opinion the PureGrit 3 will give any runner confidence to take on any trail or off road challenge. 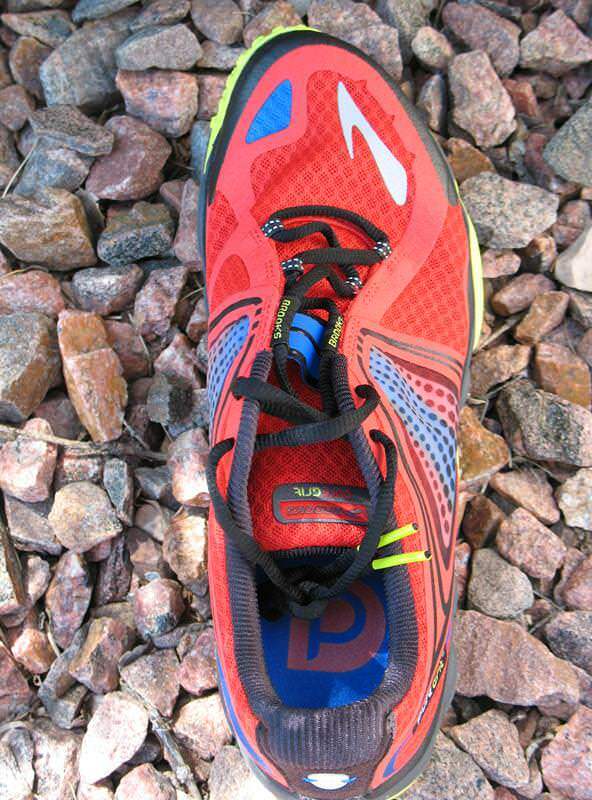 We thank the nice people at Brooks for sending us a pair of PureGrit 3 to test. This did not influence the outcome of the review, written after running more than 50 miles in them. Same overall impression as David A. York. After 1.5 months wearing them and 300kms, several lugs have already popped off and the sole has some cracks. The rest of features are really good, it’s the best running shoe I have ever tried, but the sole doesn’t reach the minimum durability level. Very disappointing. I ran the same issue on my last 21k trail race in Costa Rica, the tongue never kept centered, and gave me a lot of troubles going do in the ;ast 10 k of the trail curse, hope Brooks really find the way to fix this issue, since the shoes are a great trail racer dog! I have been a brooks shoes since long time ago, moving from pure flow 2,3 etc and now grit, used cascadia for so long but found the grit the near perfect trail shoe, hope the tongue issue get fixed on the next edition of this puppies. Yeah, I bet you thank the nice people at Brooks for sending you this shoe. Now you can wear it for a couple of runs, watch the lugs fall off and hopefully they’ll send more. I bought this shoe based on this review, worst decision ever. It fills no void, except for an empty feeling after running in it. Yes, after two miles the tongue immediately slips to the side, really annoying. Yes, the lugs literally break off, I ran one 10 mile trail run and then raced a 1/2 marathon trail run and half of the lugs on the forefoot are gone! The shoe does not feel agile, rather a bit stiff, so, not a racer. It also has a very strange configuration in the toe box as it slopes up a bit. If you further investigate the shoe, this is wear the rock plate ends. Low profile, yes. Good traction, yes, until the lugs fall off. Otherwise this shoe is a bomb. I put exactly 23.1 miles on this shoe and the sole is trashed. What a waste. Sorry Brooks, this shoe does nothing for me, no liveliness, no, nothing. Blisters and a trashed sole is what I got for $129. If your a trail runner, just find another shoe, period. For Darren, this shoe really has no pronation support, but I really never look for stability shoes for trail anyways. Hope that helps, but, buy something else. Does the puregrit fit for overpronator? 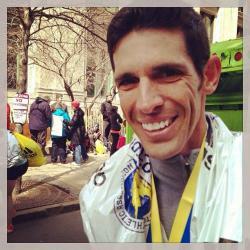 Or trail shoe did not have pronation different? Man – this is the best fitting shoe I have EVER worn. Love it! But after 2 outings I noticed the lugs started to pop off. On a third outing along the Pacific Crest Trail, several more were gone. Really a disappointment. I’ve owned Pure Grit 1 and PG 2. Seemed like Brooks really got it right on this one as it gives more protection and grip than the previous models… quality on the sole just wasn’t there. Close to useless in under 50 miles. Purchased at REI, so they will be going back.